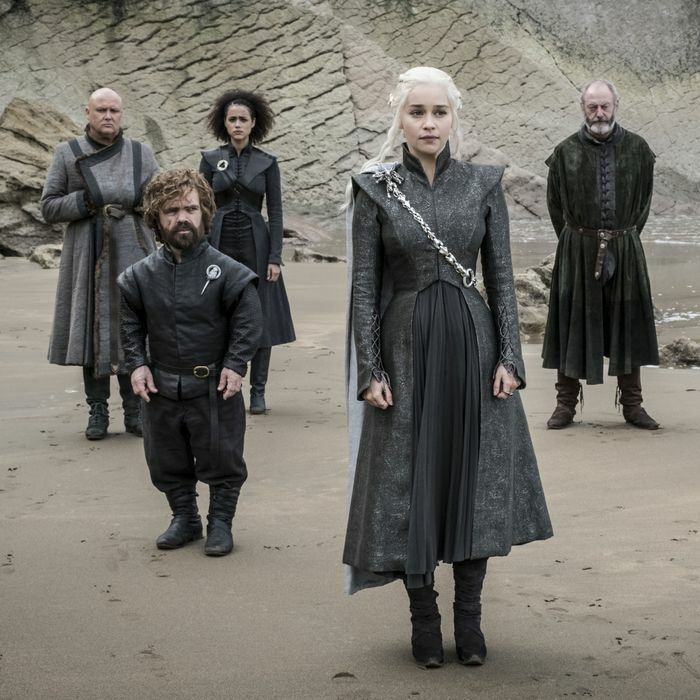 With just seven hours to get the whole kit and caboodle ready for the Final Countdown, season seven has been moving at a breakneck pace, with machinations and murders dropping as fast as you can say “Euron Greyjoy shops at Hot Topic.” “The Spoils of War” is no exception, presenting us with a slew of hotly anticipated reunions, some of which viewers have been waiting for since season one (and book readers since 1996). But with the exception of a brief scene in King’s Landing, we spent the hour in either Highgarden, Winterfell, or Dragonstone. Thanks to this narrowed focus, the story gets to breathe a bit, allowing the cast to shine and setting up some delicious new tensions to unravel in the season’s remaining three episodes. Four long-sundered sibling pairs reunite: Sansa and Arya, Arya and Bran, Jon and Theon, and Jaime and Tyrion. But first, we see Bran bid farewell — if you can call it that — to Meera Reed, the fierce substitute sister who’s been by his side since the Sack of Winterfell. When Bran denies Meera the acknowledgement and emotional connection she clearly seeks, telling her that he isn’t really Bran anymore, it presages the other sibling-to-sibling moments soon to come. None of the Stark children, Lannister children, or Greyjoy children are what they were when this story began; if there is often real joy in their reunions, there’s an undercurrent of something dark as well. Arya and Sansa meet, after six seasons, in the crypt below Winterfell. It’s a moment that underlines the female-ward turn of this season, as the two sisters gaze upon the effigy of their father, Ned, whose legacy always loomed so large over his sons and daughters. When Arya says to her sister — mostly sincerely — that the title “Lady Stark” suits her, it not only mirrors Bran’s now-repeated assertions that he’s not Lord Stark, it also recalls the way Theon once wistfully said of Robb, “His life fit him better than his clothes.” Ned’s statue may not resemble the real man because “everyone who knew his face is dead,” but as Arya retorts, the two sisters are not. The resemblance may not be perfect, but Sansa and Arya are here to carry on his memory. What’s the Deal With That Dagger on Game of Thrones? Just How Hard Is It to Kill a Dragon on Game of Thrones? Their reunion is a complicated one, and the scene provides a perfect platform to show just how good Maisie Williams and Sophie Turner are. Watch, for example, the way Arya’s eyes flutter a bit after she asks Sansa if Jon left her in charge and Sansa, somewhat tentatively, says yes. You can tell Arya has some thoughts about that, but she’s either politic enough now to not express them or she’s biding her time. Or when Arya tells Sansa that she has a list of people she’s going to kill, and the two sisters take a moment to decide if they’re going to be mutually delighted by the confession. Yes, a few lines of dialogue are a bit on-the-nose — like when Arya declares, “Our stories aren’t over yet” — but so much about the sisters’ loving, prickly, wary relationship plays out on the actresses’ faces, in the moments in between their lines. Bran also reveals that Littlefinger has given him the Valryian steel dagger that was almost used to kill him back in the first season. The dagger was a key item early in the show: After Catelyn brought it to King’s Landing to try to find out who was behind the assassination attempt, Littlefinger told her that it was his, but that he lost it to Tyrion Lannister, which is why Catelyn took Tyrion prisoner. Littlefinger held the same dagger against Ned’s neck when he confessed that he’d betrayed him, and has presumably had it ever since. Incidentally, a very similar-looking dagger also appeared, Zelig-like, in one of Sam’s Citadel books about dragonglass, so I’m assuming that when Bran hands it to Arya, the stage is being set for a Chekhov’s dagger-type situation in which Arya water-dances that blade right into some White Walker ice-flesh. Is that why Bran gives it to her? Can he see that possibility in her future? Bran has one more vision in the episode that almost slips by unnoticed. When Littlefinger gives him the dagger — which Sansa, rightly but perhaps unnecessarily, warns everyone was probably a trap, but who knows, because Littlefinger doesn’t make a ton of sense these days — Bran quotes to him, “Chaos is a ladder,” the exact phrase Littlefinger once used in an exchange with Varys way back in season three. Bran’s got his metaphorical third eye on you, Littlefinger. Over in Dragonstone, we see the third of our sibling reunions — a brief, bitter one between Jon and Theon, who’s come to ask Daenerys to help him rescue his sister Yara — but the main relationship is the one developing between Jon and Daenerys. Like Arya and Sansa in the crypt, Jon and Dany have an underground tête-à-tête in the dragonglass mines that flits between warmth and chilliness. Jon shows her a highly convenient set of cave drawings depicting the Children of the Forest and the First Men battling the White Walkers together. Meanwhile, it turns out that Daenerys doesn’t need supernatural sight to quote earlier episodes: When she tells him that she’ll aid him in the North if he bends the knee, and he says his people will never accept a Southern ruler, she asks of his people, “Isn’t their survival more important than your pride?” It’s a word-for-word quote of what Jon once said to Mance Rayder, the wildling leader who similarly refused to bend the knee to the “Southern king” Stannis. Jon, in turn, will remind Daenerys of something she once believed: Amid her intense frustration at the news from Casterly Rock, he tells her that if she brings three dragons to lay waste to King’s Landing, she’ll be no better than the terrible rulers who’ve come before her. The fourth and final sibling reunion is as moving as the ones between the Stark children, and no less so for the fact that it takes place in the middle of a battle and the two never actually exchange a word. Jaime, Bronn, and Sam’s cute brother Dickon are packing up all the gold in Highgarden to send off to the Iron Bank when ululations in the distance herald an onslaught of Dany’s Dothraki. (At this point, we just have to assume that people in Westeros have learned how to travel by tesseract.) Even more devastating than a surprise army, though, is Daenerys swooping in on Drogon, who begins laying waste to the Lannister forces — so professional-looking in their crisp reds — with giant jets of dragonfire. Between Daenerys’s airplane-size dragon and Bronn riding Qyburn’s scorpion like a tank, I couldn’t help thinking that this battle seemed almost mechanized — so different from that very bodily, medieval scrum we saw in the Battle of the Bastards. The heart of the scene, for me, is when we see Tyrion standing at a distance, watching the destruction of his brother’s forces. Earlier, Daenerys had accused him of deliberately botching his strategy because he doesn’t want to hurt his family after all. In this scene, a Dothraki says to him, “Your people can’t fight.” As we get another beat of wonderful, silent expressiveness from one of the show’s MVPs, we can see on Peter Dinklage’s face how painfully the barb lands. Later, as Tyrion watches Daenerys try to pull a giant arrow from a fallen Drogon, he mutters, “Flee, you idiot.” At first I thought he might be addressing Daenerys, who doesn’t see that Jaime is about to grab a spear and charge on her. But then it becomes clear that he’s addressing his elder brother, the only one in his family who ever had something like love for him. Just as Drogon turns his head and shoots out a jet of flame, someone — Bronn? Dickon? — rides up and knocks Jaime into the water. As we watch Jaime silently sink below the surface, a look of surprise on his face, we have to wonder if Tyrion has indirectly taken the life of yet another Lannister.